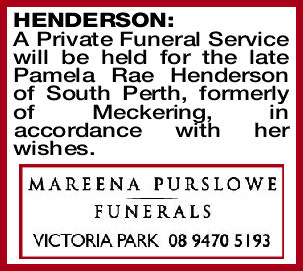 A Private Funeral Service will be held for the late Pamela Rae Henderson of South Perth, formerly of Meckering, in accordance with her wishes. 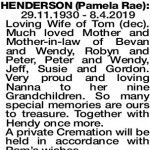 29.11.1930 - 8.4.2019 Loving Wife of Tom (dec). Much loved Mother and Mother-in-law of Bevan and Wendy, Robyn and Peter, Peter and Wendy, Jeff, Susie and Gordon. Very proud and loving Nanna to her nine Grandchildren. So many special memories are ours to treasure. Together with Hendy once more. 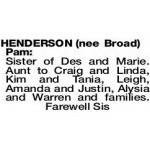 A private Cremation will be held in accordance with Pam's wishes. In loving memory of Mum and Pam, Aunty Pam to Dean, Michael and Christopher. The best milkshake maker ever. Lots of lovely memories will be missed. 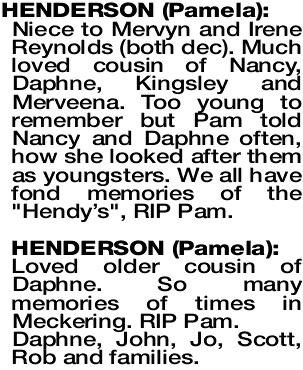 Loving memories of Mum, Pam and Nanna. We will miss your loving smile, but know you will be happy with Hendy again. Much love always. 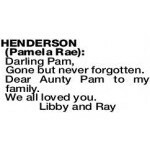 Dear Aunty Pam to my family. 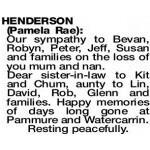 HENDERSON PAMELA Niece to Mervyn and Irene Reynolds (both dec). Much loved cousin of Nancy, Daphne, Kingsley and Merveena. Too young to remember but Pam told Nancy and Daphne often, how she looked after them as youngsters. 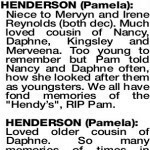 We all have fond memories of the "Hendy's", RIP Pam. Loved older cousin of Daphne. So many memories of times in Meckering. RIP Pam. Daphne, John, Jo, Scott, Rob and families. Tom wasn't late this time Pam and you were ready. Loving thoughts to all the family. From The Duperouzel Families. Our sympathy to Bevan, Robyn, Peter, Jeff, Susan and families on the loss of you mum and nan. Dear sister-in-law to Kit and Chum, aunty to Lin, David, Rob, Glenn and families. Happy memories of days long gone at Pammure and Watercarrin. 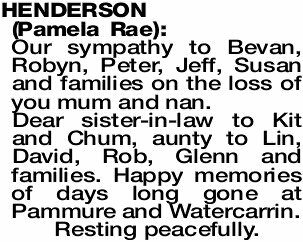 Our deepest sympathy to the Henderson family. A wonderful and loving lady, pseudo big Sis to Nancy and Aunty. We have many great memories, especially of the times spent on the farm with you and Uncle Tom. Brian, Nancy, Ian, Vicki, Ross, Helen Bresland and families. Deepest sympathies to Pam's family on her recent passing. The President, Executive and Members.